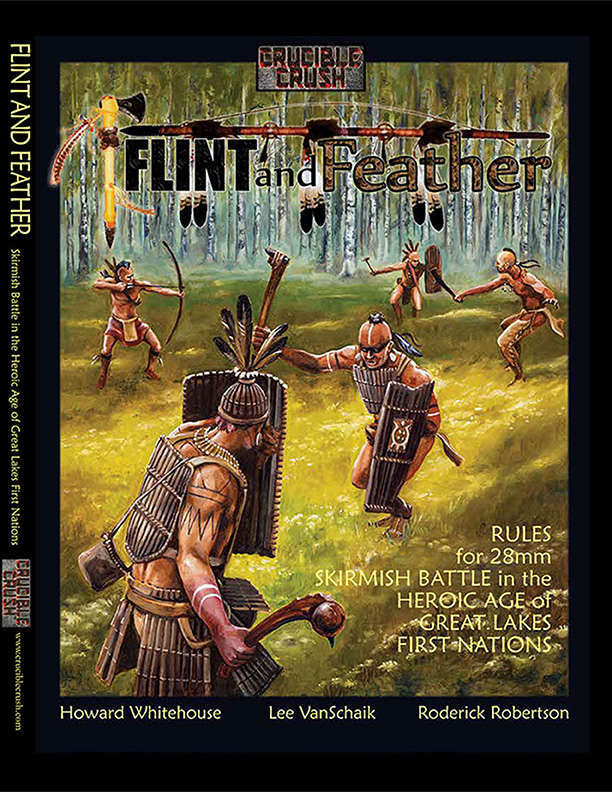 This is the PDF of the rules for Flint and Feather the 28mm Tabletop Skirmish Miniatures game. Become a Great Warrior and lead your warband to victory in the legendary period of the Great Lakes region of North America. These rules bring this legendary period of history to life with things like Orenda, Natural and Supernatural creatures and the collection of furs. Grow your Striplings to be important contributors to the Warband in the Campaign game and bring Shamans and Healers to the battlefield to influence the outcome of the game. This PDF is 160 pages and includes Quick Reference Sheets and all the cards you need to play the game. It is designed for use with the Flint and Feather 28mm miniatures which are available online from Crucible Crush. So join us and unleash your Great Warrior on the tabletop! The Video below is an example of the quick start rules found on page 6 of the Rulebook.